This book is currently in development. The dawn of the 21st Century presents an increasingly complex global security environment. Within this environment United States national interest, citizens, and territories are threatened by regional instability, failed states, increased weapons proliferation, global terrorism, unconventional threats and challenges from adversaries in every operating domain. If we are to be successful as a nation, we must embrace the realities of this environment and operate with clarity from within. It is this setting that mandates a flexible, adaptive approach to planning and an ever-greater cooperation between all the elements of national power, supported by and coordinated with that of our allies and various intergovernmental, nongovernmental and regional security organizations. It is within this chaotic environment that planners will craft their trade. 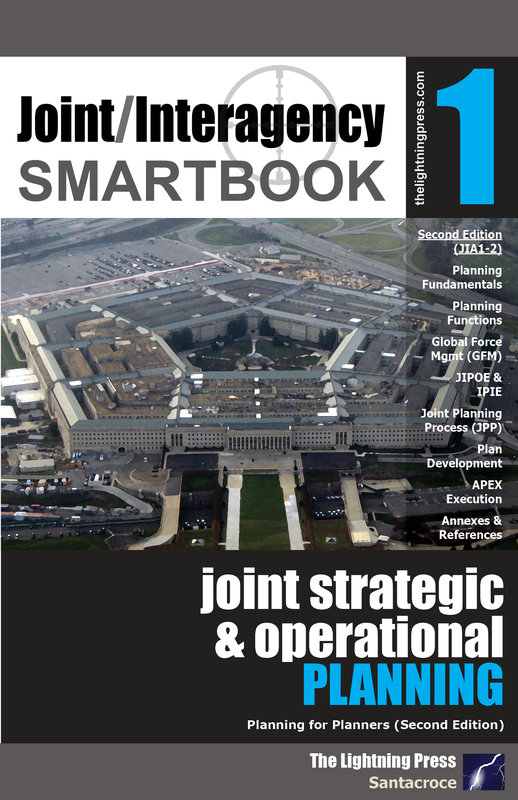 Joint/Interagency SMARTbook 1: Joint Strategic & Operational Planning (Planning for Planners), 2nd Edition (JIA1-2), was developed to assist planners at all levels in understanding how to plan within this environment utilizing the Joint Planning Process (JPP); an orderly, logical, analytical progression enabling planners to sequentially follow it to a rational conclusion. By utilizing this planning process, which is conceptually easy to understand and applicable in all environments, any plan can come to life. Paramount to planning is flexibility. The ultimate aspiration of this book is to help develop flexible planners who can cope with the inevitable changes that occur during the planning process in any environment. Planning for Planners has been utilized since 2007 by war colleges, joint staffs, Services, combatant commands and allies as a step-by-step guide to understanding the complex world of global planning and force management. 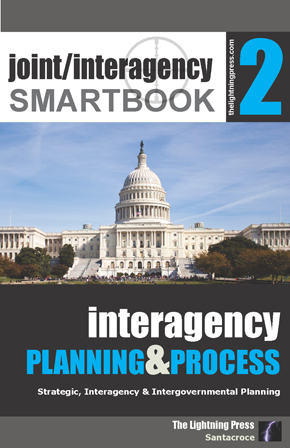 JIA1-2 is the second edition of Joint/Interagency SMARTbook 1: Joint Strategic & Operational Planning (Planning for Planners), completely reorganized and updated with the lastest joint publications for 2019. At 408-pgs, JIA1-2 is designed to give the reader a thorough understanding of joint planning and the adaptive planning and execution (APEX) enterprise, where the JPP resides. Topics and chapters include planning fundamentals, planning functions, global force management, JIPOE & IPIE, joint planning process (JPP), plan development, APEX execution functions, and annexes. As a Nation we must maintain a state of readiness to respond to both natural disasters and man-made threats. National response and preparation is the term used to describe the efforts of Federal preparation and Regional coordination of resources and materials required for the material, financial, and cooperative support of all-hazards response at the State, Tribal, and Local level. At the National level, these efforts reflect consideration of both disaster response and national security requirements. The National Response Framework (NRF) and National Incident Management System (NIMS) provide framework and function for the concepts, structures, and coordination involved the preparation and coordination of the knowledge, systems, and resources required for all-hazards response. NRF includes all presidential directives, plans, and programs, associated with disaster response and all support efforts provided by those agencies not directly tied to disaster response, but offering support. NIMS directs and standardizes aspects of coordination and cooperation within and between Federal and Regional response efforts. Critical infrastructure is a term used by governments to describe assets that are essential for the functioning of a society and economy - the infrastructure. Protection is the preservation of the effectiveness and survivability of personnel, equipment, facilities, information, and infrastructure. The Multiagency Coordination System (MACS) is a system that provides the architecture to support coordination for incident prioritization, critical resource allocation, communications systems integration, and information coordination. Multiagency Coordination Systems assist agencies and organizations responding to an incident. 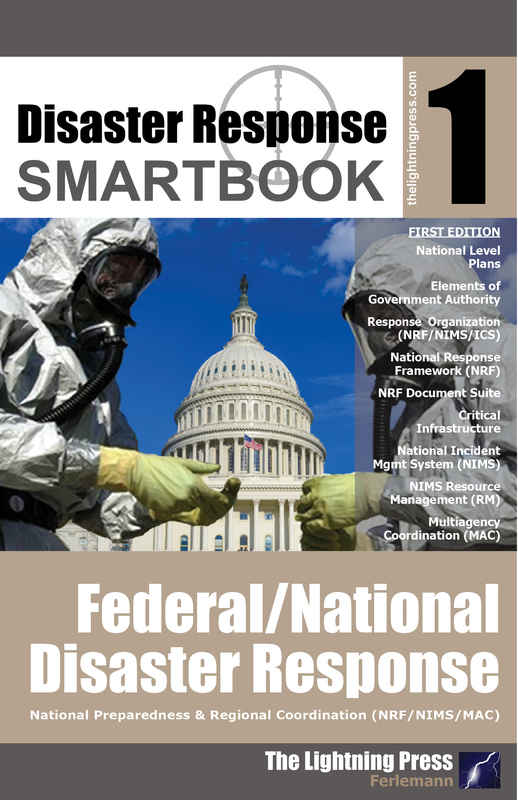 This SMARTbook provides a detailed explanation of National Response Framework (NRF) and National Incident Management System (NIMS), as well as discussion of the Multiagency Coordination Systems (MACS) as a skill set. It is designed to serve as an introduction to NRF and NIMS concepts, reference documents, and application; as a pocket reference for experienced responders; or as a desk reference for emergency planners, community leaders, or any responder involved in the process of preparation and coordination of response support and leadership. United States armed forces operate in an increasingly network-based world. The proliferation of information technologies is changing the way humans interact with each other and their environment, including interactions during military operations. This broad and rapidly changing operational environment requires that today’s armed forces must operate in cyberspace and leverage an electromagnetic spectrum that is increasingly competitive, congested, and contested. Cyberspace is a global domain within the information environment consisting of the interdependent network of information technology infrastructures and resident data, including the Internet, telecommunications networks, computer systems, and embedded processors and controllers. Operations in cyberspace contribute to gaining a significant operational advantage for achieving military objectives. 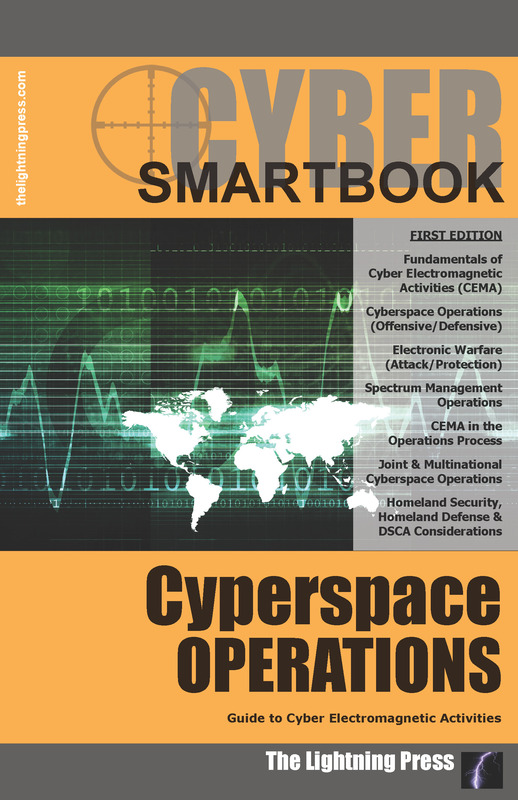 Cyber electromagnetic activities (CEMA) are activities leveraged to seize, retain, and exploit an advantage over adversaries and enemies in both cyberspace and the electromagnetic spectrum, while simultaneously denying and degrading adversary and enemy use of the same and protecting the mission command system (ADRP 3-0). CEMA consist of cyberspace operations, electronic warfare, and spectrum management operations. Cyberspace operations (CO) are the employment of cyberspace capabilities where the primary purpose is to achieve objectives in or through cyberspace (JP 3-0). Cyberspace operations consist of three functions: offensive cyberspace operations, defensive cyberspace operations, and Department of Defense information network operations. Electronic warfare (EW) is any military action involving the use of electromagnetic and directed energy to control the electromagnetic spectrum or to attack the enemy. EW consists of three functions: electronic attack, electronic protection, and electronic warfare support. These functions are referred to as divisions in joint doctrine. Spectrum management operations (SMO) are the interrelated functions of spectrum management, frequency assignment, host-nation coordination, and policy that enable the planning, management, and execution of operations within the electromagnetic operational environment during all phases of military operations. SMO are the management portions of electromagnetic spectrum operations (EMSO). EMSO also include electronic warfare. This SMARTbook is currently in development. 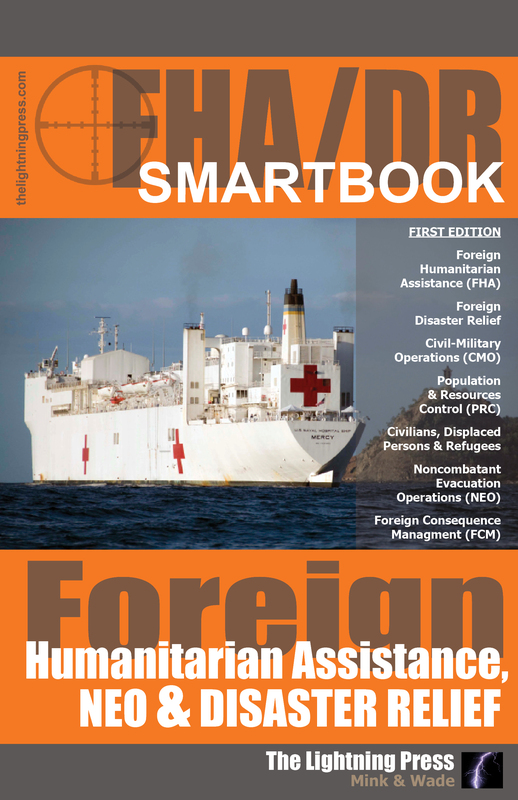 Foreign humanitarian assistance (FHA), to include foreign disaster relief, consists of Department of Defense (DOD) activities, normally in support of the United States Agency for International Development (USAID) or Department of State (DOS), conducted outside the United States, its territories, and possessions to relieve or reduce human suffering, disease, hunger, or privation. FHA activities conducted by US Armed Forces range from steady-state program activities supporting geographic combatant commanders (GCC) security cooperation and related programs to conducting limited contingency operations in support of another United States Government department or agency. FHA operations can be supported by other activities conducted by US military forces or they may be conducted concurrently with other types of related operations and activities such as dislocated civilian support, security operations, and foreign consequence management. The Department of Defense has unique assets for effective response and can play a key role in foreign humanitarian crises. For example, the US military possesses exceptional operational reach that can be employed to enhance an initial response. Additionally, the US military augments private sector capability and thus limits threats to regional stability. Furthermore, the US military’s unmatched capabilities in logistics, command and control (C2), communications, and mobility are able to provide rapid and robust response to dynamic and evolving situations among vastly different military, civilian, and government entities. Regardless of where the U.S. military conducts operations, the complex and ambiguous nature of today’s contemporary operational environment will often include large groups of displaced populations -- to include refugees, internally displaced persons, migrants, and stateless persons. Population and resources control (PRC) consists of two distinct, yet linked, components: populace control and resources control. For practical and security reasons, military forces employ PRC measures of some type and to varying degrees across the range of military operations. Noncombatant evacuation operations (NEOs) are conducted by the DOD to assist in evacuating US citizens and nationals, DOD civilian personnel, and designated persons whose lives are in danger from locations in a foreign nation to an appropriate safe haven, when directed by the Department of State. Foreign consequence management (FCM) is assistance provided by the U.S. government to an impacted nation to mitigate the effects of a deliberate or inadvertent chemical, biological, radiological or nuclear (CBRN) incident. This SMARTbook is currently in development, projected for release in the 2018-2019 timeframe. Joint operation planning consists of planning activities associated with joint military operations by combatant commanders (CCDRs) and their subordinate joint force commanders (JFCs) in response to contingencies and crises. It transforms national strategic objectives into activities of joint forces. The Department of Defense (DOD) conducts interorganizational coordination across a range of operations, with each type of operation involving different communities of interests and structures. This is especially pronounced for domestic and foreign operations, which are governed by different authorities and have considerably different US Government (USG) governing structures and stakeholders. 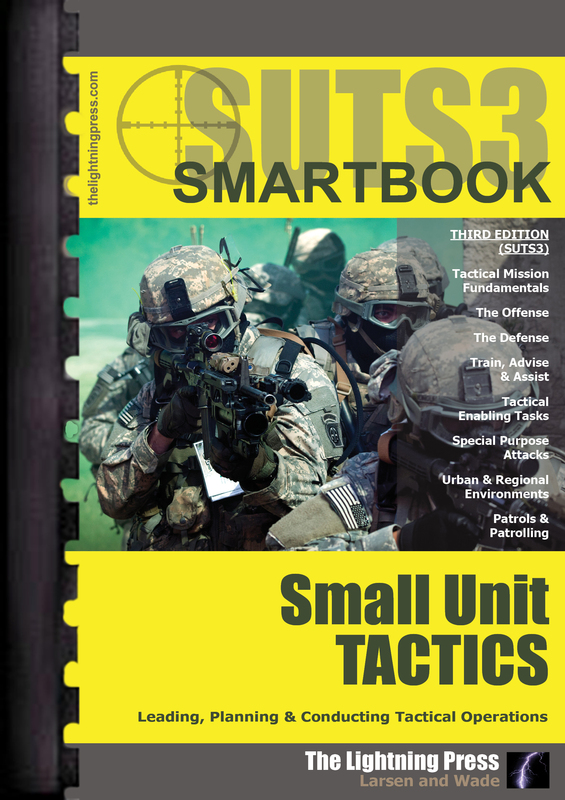 SUTS3: The Small Unit Tactics SMARTbook, 3rd Ed. (with Change 1*) is the second revised edition of The Small Unit Tactics SMARTbook, featuring the full scope of new material and Doctrine 2015 updates to include ADP/ADRP 3-90 Offense and Defense, ADP/ADRP 5-0 The Operations Process, ADP/ADRP 6-0 Mission Command and more than 20 additional references. Chapters and topics include tactical mission fundamentals, the offense, the defense, stability and counterinsurgency operations, tactical enabling tasks (security, reconnaissance, relief in place, passage of lines, encirclement, and troop movement), special purpose attacks (ambush and raid), urban and regional environments (urban, fortified areas, desert, cold region, mountain, and jungle operations), patrols and patrolling.